Trainer Stuart Coltherd and jockey Sam untack Achill Road Boy in the Fakenham winners enclosure after Monday's race. A punishing travel schedule proved well worthwhile for Selkirk’s Coltherd Racing team at the weekend, with two horses from the Clarilawmuir yard notching impressive placings. 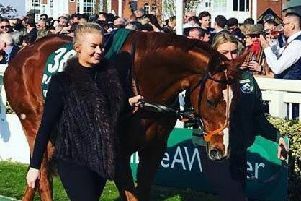 An outstanding run at Haydock Park on Saturday by trainer Stuart Coltherd’s top steeplechaser, Captain Redbeard, saw the nine-year-old gelding finish second behind The Dutchman in the day’s feature race, the Grade 2 Peter Marsh Handicap Chase. Expertly piloted by Stuart’s son Sam, Captain Redbeard’s impressive form this season has previously seen him win the prestigious Betfred Tommy Whittle Handicap Chase, as a result of which Paddypower is quoting odds of 100/1 for the horse to win the 2018 Grand National. Meanwhile, Monday’s 13-hour round trip to Fakenham, in Norfolk, proved a rewarding exercise for Coltherd Racing when Achill Road Boy finished second in the ROA/Racing Post Owners’ Jackpot Handicap Steeplechase. Trained by Stuart Coltherd and ridden by Sam, Achill Road Boy battled gamely in the heavy going but eventually had to give second best to the Olly Murphy-trained Wood Pigeon.